strategically respond to anti-Semitism and anti-Israel rhetoric on campus. An interactive evening for high school students and their parents, designed to empower and equip attendees with constructive and effective responses to combat anti-Semitism and anti-Israel bias on campus. Click here to RSVP (required). For students and parents. Incidents of bias and harassment on university campuses make it clear that the ideals of the higher education environment—inquiry, free expression and the civil exchange of ideas—can be easily exploited by perpetrators of hate. In this interactive workshop, students and their parents will gain the resources and tools to strategically respond to those acts of hate. Facilitated by the Anti-Defamation League (ADL). What are the origins of the anti-Israel movement on campus? What are its long-term goals and how can people who truly care about democracy be concerned with it? Ambassador Aharoni, who has lectured in over 100 universities in North America, proposes a solution to the problem. 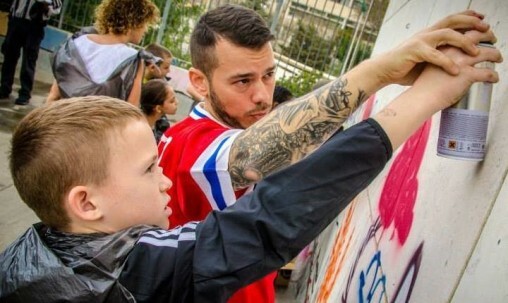 A hands on graffiti project bringing together talented artists from Artists 4 Israel and high school students to engage in a collaborative project expressing Israel's right to exist in peace and security. Click here to RSVP (required). For students only. Engaging students to use their voices through artistic expression and to empower them to change the conversation about Israel, Artists 4 Israel’s executive director, Craig Dershowitz and fellow visiting artists from around the world make the connection from art to advocacy, showing that there are many ways to tell Israel’s story and that everyone can have a role in changing the conversation about Israel. FIND YOUR VOICE. LEAD THE CONVERSATION. Build confidence. Gain the knowledge and skills to respond.